Video-Sen Jeff Merkley calls Kavanaugh's views on executive immunity "fit for a King"
The Senate confirmation hearing for Trump's Supreme Court nomiee Brett "KKKavanaugh" descended almost instantly into chaos. The GOP required all questions by the Dems to be submitted in writing and pre-approved. One Democratic Senator moved to adjourn the hearing after having 41,000 pages of documents dumped in their laps the previous night. Protests erupted like a string of firecrackers going off. By the end of the week, more than 200 people had been arrested in days of repeated protest and disruption. The GOP demand that the Democrats ask no questions and make no statements other than those pre-approved by the GOP-controlled Judiciary Committee has been called entirely unprecedented. This is the kind of raw-power tactic favored in legislatures that exist to provide dictators (Trump?) with a rubber stamp. Some of the Democrats want to walk out, but Joe Biden is interfering, whining that staying in as more powerful even if the game is rigged. Those favoring the walkout rightly state that playing by the GOP's rules lends legitimacy to an utterly illegitimate hearing, process, ans nominee. 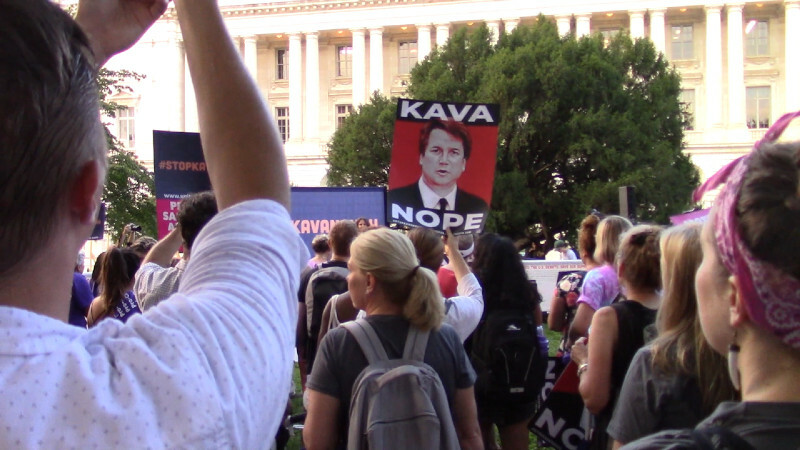 Still, as the hearing went on both Democratic Senators and protesters derailed the Trump train again and again, blasting the scripted, pre-planned hearing off-course with interruption after interruption and disruption after disruption. 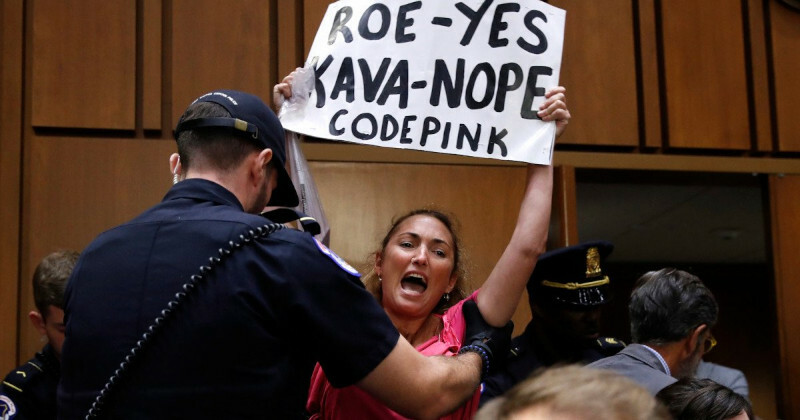 KKKavenaugh's daughters were rushed from the room as the chaos escalated at one point, and the protests hit home hard enough that a flustered Donald Trump called for banning at least these protests (if not all protests) in an interview with the extreme-right Daily Caller. His exact words were ""I think it's embarassing for the country to allow protesters." This is what Adolf Hitler or Kim Jong Il would say and reveals the true nature of both Trump and Kavenaugh. 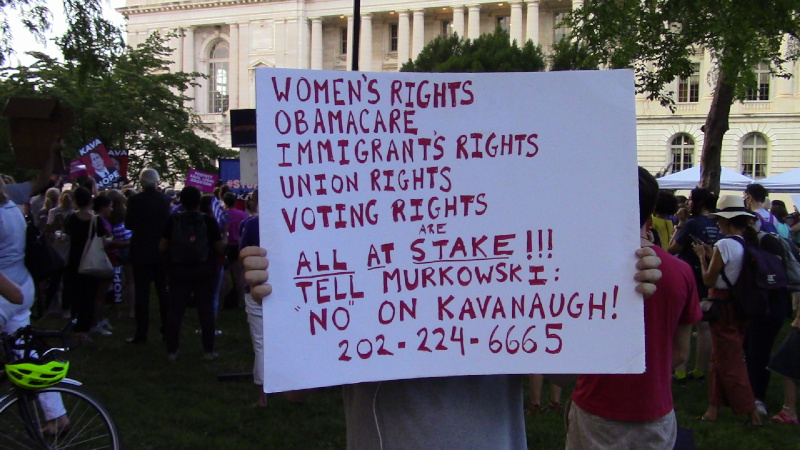 After the hearings, several Senators spoke at an outdoor rally on the US Capitol Grounds. 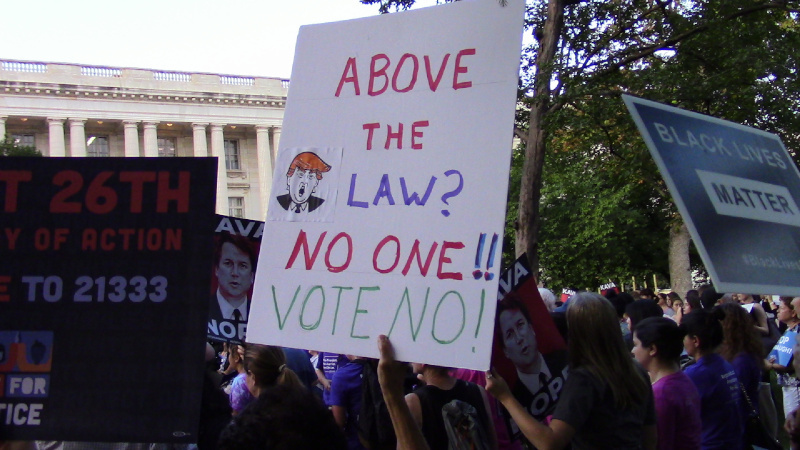 In addition to Kavanaugh's horrifying anti-choice views, his view that sitting presidents are immune to subpeona and investigation much less prosecution drew heavy fire. Senator Jeff Merkley said Kavanaugh's views on executive power are "fit for a King and a Kingdom" but not for a democracy. Some have said the proposed walkout is the one and only way Democrats can stop Brett KKKavanaugh from being seated. There is word the Democrats discussed boycotting the hearings from the jump, but decided to start off instead with a strategy of maximum possible disruption. This hearing is in the Judiciary Committee, and it is the (later) floor vote that is most volnerable to a quorum denial strategy. If the Democrats do this and do it in strict party unity, that is 49 Democrats plus John McCain(dead) not present, and the Senate lacks a quorum and can conduct no business. There are an estimated four Senate Democrats that will need a firm hand and tough discipline from party leadership to keep them from defecting not only on any walkout but possible even voting for Kavanaugh. If the Democrats fail to stop Brett KKKavanaugh, and worse yet if some Democrats vote with the GOP to confirm him, that could send blue-state voters home in November. Thus, if the Democrats play their usual "go along to get along" game, they could forfeit a "Blue Wave" election that otherwise would allow them to wrench the House of Representatives away from the minions of Donald Trump. The stakes go beyond the coming election. Brett KKKavanaugh has stated that a sitting president is immune to investigation, much less to prosecution. The Washington Post has warned he would seek not only to overturn Roe v Wade, but to impose a finding that a fetus has a right to life to make abortion a felony in all 50 states. Some say the status of women in the US would be thrown all the way back to 1951. At that time, some states required a woman to have the signed permission of her husband to purchase birth control, and forbade the sale of contraceptives to unwed women. Can you say "Saudi Arabia on Turtle Island?"